Are you worried about your hammy climbing or jumping out of her cage or tank? Though most hamster behaviors are perfectly normal and don’t require special accommodations, there are two actions that could cause owners some stress: jumping and climbing. We’ve compiled our research into hamster behavior to help you understand why hamsters climb and jump, as well as how you can help keep them safe. Yes, some hamsters can climb and even jump (mostly from a high spot to a lower one). While many hamsters show a great love of physical activity, the types of activities they enjoy differ from one hammy to the next. Some hamsters are especially athletic and love to get into all manner of mischief. This can include jumping from and climbing to heights that prove dangerous to their safety and can cause injury if they fall. 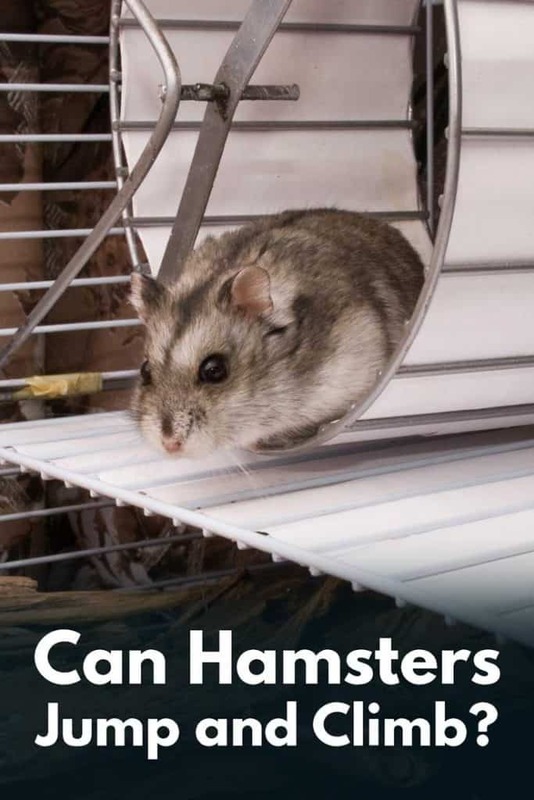 Fortunately, there is a lot that owners can do to facilitate their hamster’s natural love of exercise. From the purchase of new toys to the cultivation of a cage that is designed with safety in mind, there are many steps that you can take to ensure safety and fun all at once. Continue reading to learn how you can best nurture your hammy’s love of jumping and climbing without jeopardizing his or her safety. Do All Hamsters Love to Jump and Climb? The long answer: Whether a hamster is enthusiastic about jumping and climbing depends on a number of factors. If they feel bored within their cage, or it’s too small, hamsters are likely to start climbing the bars or trying to find a way to jump out. Some hamsters, however, are just especially athletic and that should be nurtured as a part of their personality. If your hamster seems to be on the lazier side and not really care for these particular antics, don’t worry! That could just as easily be a part of their personality! Is it OK for My Hamster to Climb the Bars of Their Cage? 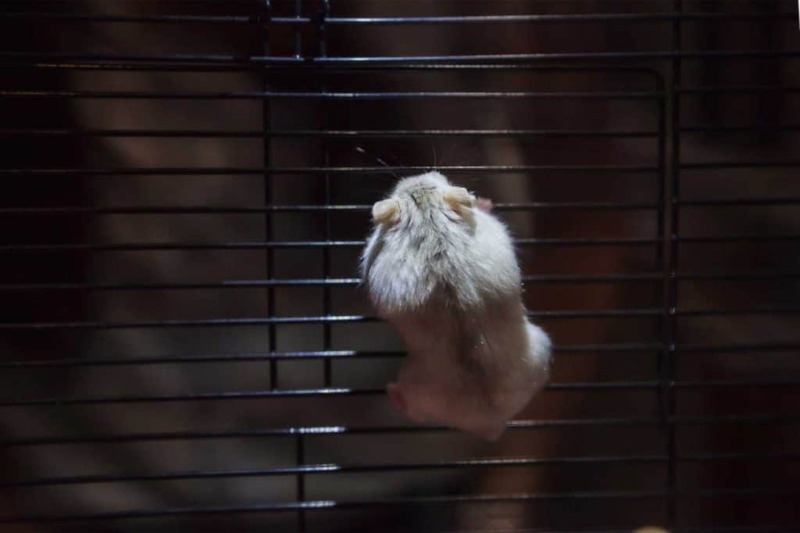 If your hamster’s cage is of the traditional wire-barred variety, you may see him or her climbing as if they are attempting to make their great escape. In taller cages, this can be quite the issue, as they are afforded more room to fall if they lose their footing. While climbing a short distance and then falling onto a well-covered and cushy cage floor isn’t a great cause for concern, longer drops can inflict serious harm. This includes broken limbs, which can be very difficult to treat in such small mammals. One of the best things you can do is to look for common causes behind bar-climbing behavior. Why is My Hamster Climbing the Bars of Their Cage? One such cause is the hamster trying to get away from something in their cage. Look around the cage for soiled bedding, feces or spoiled food that could be unpleasant to your hamster’s senses. Another cause is simply boredom. Hamsters need a lot of stimulation to keep themselves entertained within the confines of their cage, so you need to provide an enriching environment. Make sure to include climbing toys, like this Niteangel natural wood climbing ladder. Toys like this give them something safe and designated to climb on – instead of their cage. How Can I Make the Cage Safe for My Bar-Climbing Hamster? If you have tried all of this with little to no success in ending the cage-climbing, your hammy might just be a really avid climber. This could mean adjusting his or her cage to meet their unique needs. For some hamster owners, this entails switching from a barred cage to one like an aquarium. This totally eliminates the risk of climbing bars, as there are no bars to climb. If you cannot get a new cage for your hamster at this time, there are things that you can do to make a cage safer for a bar-climber. You can add more bedding to their environment, which will cushion their fall and hopefully prevent injury. This is a fast and inexpensive way to address the issue and give you some peace of mind. It is also worth noting that falling onto plastic toys can cause harm to a hamster. If your hammy is intent on climbing the walls of his or her cage, make sure to move all plastic toys from their falling distance. Centralize toys toward the center of the cage to minimize the risk of this happening. Most of the time, hamsters will simply drop themselves from the cage, rather than jump, so it’s a pretty straight shot downward. Whether your hamster is climbing the walls of their cage or simply love the thrill of a climbing toy that you’ve provided, you want to make sure that you’re allowing them to play safely. The same is true of hamsters who are fond of jumping – either off of things or from their owner’s very hands. Read on to see some valuable tips that will keep your athletic hammy safe. Hamster bodies are fragile, little things. A fall from a great height can cause tremendous, even life-threatening, injury. For this reason, it is best to purchase toys that have been created with these small-framed creatures in mind. Toys meant for larger animals are often more elevated and can increase the risk of falling-related injuries. It’s never a bad thing to pack the bottom of the cage with what seems to be a lot of bedding – especially if your hamster is a climber. Even if they aren’t climbing as high up as the bars at the top of their cage, this is good practice. After all, it’s always better to fall onto a softer surface than a harder one. I think we can all agree on that. Hamsters have a knack for trying to leap out of their owner’s hands when they are being held. Whether you’re just squeezing in some training time or are trying to move them so that you may clean their cage, they’ll take a chance if they see it! Instead of taking your hamster out of their cage and holding them in the open air, make sure to have something beneath your hands in case they try to jump away. A table or countertop suffices nicely, as these are easy to hold our hands over due to their height relative to us. Ledges and platforms inside of a hamster cage can be a great way to create an interesting terrain. However, these same platforms can pose safety risks if not installed with caution. For instance, even if your cage is rather tall, do not install platforms that go all the way to the top. Hamsters do not see very well and cannot gauge how far a drop is at any height, least of all from the top of their cage. Platforms should be low enough that the hamster can climb up onto it using his or her own devices, or with the assistance of a small stair. This standard indicates that the hamster will not have far to fall if he or she loses their footing and drops down to the bottom of the cage. If your hamster has a love of climbing or jumping when in their cage, they might go nuts when out and about in a designated play area outside of it! Many hamster owners like to give their hamster some “free roaming” time in a room that’s been outfitted to be safe for them to play in for a brief time. If this is the case for you and your hammy, you might want to take some precautions. Blankets and towels can be used to help soften the floor if your pet is a precocious daredevil. Falling from a great height is the biggest risk associated with climbing and jumping behaviors, so the more you safeguard against this, the better off your hamster will be. Read more: How to hamster-proof a room. As a part of their natural instincts, a hamster may feel especially inclined to jump or climb in any environment they’re in. There’s nothing wrong with your hamster if he or she is an avid athlete or if they prefer a more laid-back and less active lifestyle. A lot of this can be summed up with the hamster’s individual personality. Just as it goes with people, some are more energetic and livelier than others. And that’s okay! What matters most is how you address these behaviors when they come up. Outfitting the hamster’s cage with the right toys to ease boredom and facilitate healthy climbing or jumping behaviors is a great step. So is adding more bedding to their cage to prevent painful mishaps. As long as you keep in mind a hamster’s natural limitations – particularly their fragile size and their poor eyesight – you will have a long and happy relationship with your active pet. No matter how much you may try to discourage climbing or jumping with other behaviors and distractions, you might just have to learn to deal with this. Observe them closely, try to rule out why they are climbing or jumping, and go with the flow if you must. Why do hamsters eat their babies (and how to prevent that from happening)?